What makes The Fault in Our Stars such a massive yet precise story is that in its universal themes we find the story of young love. You can call young love universal as everyone's lives have no doubt been touched with some slight experience of it. To couple that young love with the less innocent, more universally crushing realities of knowing someone who suffers from the malady we call cancer make it all the more affecting. 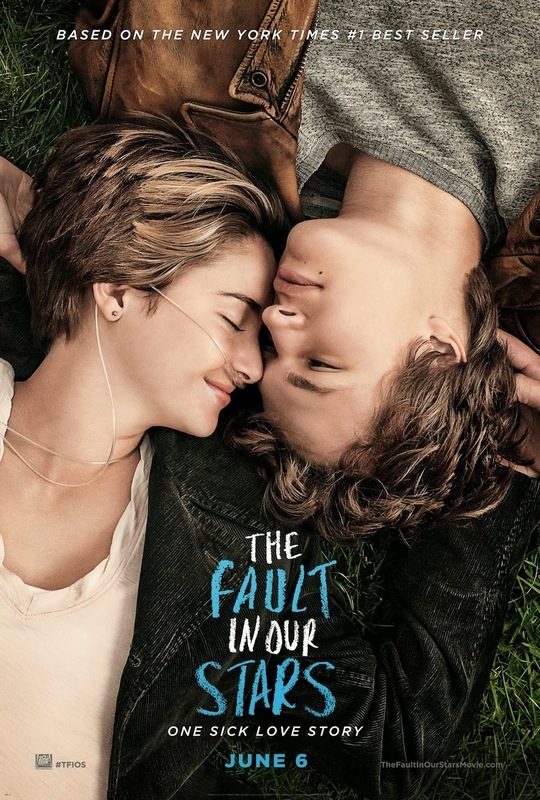 The Fault in Our Stars, a film based on a young adult novel that features a different kind of lead female heroine is not so much a story intent on making you cry, but at the very least intent on making you realize. As written by John Green we experience the trials and tribulations of being a teenager with cancer through the eyes of Hazel Grace Lancaster. Hazel Grace, as she is so lovingly and consistently referred to by the great star-crossed love of her life, is a highly articulate and intelligent young woman whose diagnosis (because to say battle or fight would be to label the situation as something it so clearly isn't in the way we typically think of those terms) has allowed her serious perspective for her age. For Hazel everything is about perspective and everything that consumes her life is a measure of leaving as little hurt as possible behind when, not if, she dies. This selflessness is admirable and we understand her reasoning despite the fact our natural tendencies are to make sure we leave some kind of legacy, but it is this string of thought, and this need to feel substantial that comes to form the backbone of the relationship that develops between Hazel and Augustus Waters. As a film, this story is still able to exist solely within the view of Hazel and how she appropriately approaches her world. As she tells her story there is never a sense of pretension or ingenuity that would strike one of expounding these ideas on others solely for the satisfaction of the attention it might receive. Hazel's ideas instead simply relay a story that meant a lot to her as Peter Van Houten and his novel, An Imperial Affliction, did for her. She doesn't need the acknowledgments or the congratulations to know she and her love story are appreciated. It is in the power that has come in the form of the real-world reaction to this material that we believe in Hazel Grace and that the tears she causes come from the most sincere of places. Augustus Waters (Ansel Elgort) offers nothing less than Dutch tulips to Hazel Grace (Shailene Woodley). We meet seventeen year-old Hazel (Shailene Woodley) as she explains to us she has never been anything more than terminal and a grenade waiting to go off, but this is a story as much about her illness as it is about the life she chooses to live before its numbered days are cut short. In those numbered days she is introduced to Augustus Waters (Ansel Elgort who, yes, plays Woodley's brother in the Divergent series) through a cancer support group that takes place in the "literal heart of Jesus" which is actually the basement of a church. This support group is led by the seemingly oblivious Patrick (Mike Birbiglia) who once had testicular cancer and who unfortunately doesn't get the character devotion here that he does in the book. Naturally there were going to be some differences between Green's novel and the screen adaptation, but for the most part screenwriters Michael H. Weber and Scott Neustadter ((500) Days of Summer and The Spectacular Now) have translated Green's story to the screen in a way that while not encompassing every detail (and to my dismay some of the more vital ones that made the situation feel more authentic and not so much a cliched love story) still keeps the emotions our main characters are feeling intact. The script still kept the majority of the heightened, yet completely charming dialogue. Augustus or "Gus" is the prince charming of guys who rarely exist; the boyfriend who doesn't like sports, but still enjoys video games enough that he seems somewhat imaginable but also completely competent when it comes to making every situation a best case scenario and never coming off as needy or clingy. These qualities are the things the hoards of young women in the audience for this film will take notice of and Green has tapped into each and every one of their desires in creating Augustus. Even so, what makes him desirable to Hazel is also what she comes to challenge the most within him. She sees Augustus, a cancer survivor who lost his leg in the process, as someone able to overcome their disease and live life to the fullest despite his setbacks while Hazel only dreams of being able to do such things. She re-assures herself with the fact Gus never knew what it was like to be terminal. Gus feels compelled to leave a widespread legacy while Hazel only strives to minimize the casualties in her wake. They balance one another out in this regard and it is this deeper connection that both young and older audiences will relate to. These deeper connections help the audience to accept this as a genuine love story and not the naive, easily-dismissed teen romance it could have so easily resorted to. Clearly, I have read the book from which this film has come and though I didn't outright love the novel it was one that struck me with a measured amount of emotion that truly felt earned. The issue in translating that kind of story to the screen is re-capturing the elements that made the heavy emotion involved in a story such as this just as valid and credible within a visual sense (and a lack of wording) that can cause major differences in how an audience perceives it. The emotion needed to be conveyed in a way that didn't put the intent to make audiences cry at the center, but one that induced those feelings because we'd come to care about the characters. In order to do that the casting was going to have to find actors who could pull off these heightened reality teenagers and their almost academic-like speaking patterns and bring them to conceivable human form. In both Woodley and Elgort they have done so successfully and it is in these two core performances that we go along for this ride without a seconds hesitation. As Hazel, Woodley possesses an intelligence beyond her years in that she not only loves to read and fill her mind with as much new and useful information as possible, but also enjoys a well-rounded dose of enlightenment from the likes of America's Next Top Model while realizing what she is watching is junk TV and isn't really worthy of the analysis her counterpart likes to imply on anything he comes across. Gus knows what to say no matter the circumstances and this, while making him completely unbelievable, is also the defining characteristic that makes us trust him and his pure adoration for all that Hazel is and all that he could have dreamed of in a girl her age that exists in a time of social media and endless amounts of unnecessary information and ever-changing trends. As this ideal, Elgort gets everything about his character right (a star-making performance really) as he delivers line after line of perfectly calculated dialogue that strikes a balance of being both human, witty and sarcastic with just the right amount of modesty that he is impossible not to like and admire. Without these core performances the film would fail around them. Yes, there are supporting players like Nat Wolff who ups the laughter levels helping to balance the tears with his humor, and both Laura Dern and Sam Trammell portray every parents nightmares in perfectly understanding fashion, but as the driving force the faults of this film are not in its stars. Augustus and Hazel help their friend Isaac (Nat Wolff) get over an ex-girlfriend with a public therapy session. If the film has any faults they only come by way of not necessarily knowing what to do or how to perfectly close this accurate and relevant embodiment of the frailty of life. At a crucial juncture in the story we come face to face with the aforementioned author, Van Houten, as portrayed by Willem Dafoe. Van Houten's section is absolutely necessary to the progression of the story, but it always felt like the most unrealistic part of both the book and now the film. Both Augustus and Hazel refer to what they call "Cancer Perks" throughout the film and are self-explanatory in that they are slight passes they've been given in life simply because they have cancer. Though getting an all-expense paid trip to Amsterdam to meet your favorite author seems a little too far fetched and in many ways reduces what I feel is the ability of Green to successfully convey all he wanted to in his story. To keep Van Houten at a distance would have been to never lose the mysticism that Hazel still found present in the world. What the meeting with Van Houten brings to the surface is that shattering of the already limited illusions Hazel allows herself to succumb to. In the execution of this as it's brought to the screen we realize how little the plight of Van Houten adds to the overall narrative. The fact that he comes in late in the second act, disappears and only re-appears momentarily again in the last fifteen minutes makes it seem the emotions and situations produced from his arrogance could have been created in a more realistic fashion that would have followed the guidelines of Hazel's narration all the more closely. This along with the film tacks on one too many endings in an attempt to hit all the beats of the book cause it to drag slightly in the last half hour. Much of these shortcomings are to be forgiven though as it is only doing its best to do justice to the beloved source material. Director Josh Boone (Stuck in Love) captures the spirit of Green's words with non-intrusive directing and by letting the performances of his actors flourish in this carefully crafted, but all around natural environment. This directing style lands this picture carefully on the ground where it needed to be and needed to stay so that we too, can believe in something as precious as being a privilege for someone else to love.